Have you heard? SoftSoap* skin is in™! Its irresistible fragrances and ultra-rich formulas will transform your shower into an indulgent experience. So go ahead, give your skin the moisture it deserves! As you all know I’m a fitness instructor, and I teach a lot of classes. Lots of exercise = lots of sweat. To say I go through a lot of body wash is an understatement. So when I was offered the opportunity to review Softsoap’s two lines of body wash I jumped at the opportunity. I’ve used Softsoap in the past (the Juicy Pomegrante & Mango Infusion scent was even on my Christmas list last year) and was thrilled to have the chance to promote a brand I already knew I loved. Intense fruity and floral scents turn ordinary showers into joyful celebrations. Softsoaps indulgently rich formulas deliver waves of moisture right down to your toes. Cue excited dancing around the house. That, my friends is 9 bottles of body wash. The basket arrived on one of my crazy days (when I teach 3 intense classes) so by the end of the day I was more than ready for some me time. And it just so happens my favourite way to unwind after a hectic day is by having a nice bath. I hate taking showers, and find that particularly with my Fibromyalgia, my muscles really need a good soak after doing so much exercise so taking a nice bath really helps keep my muscles from aching and helps calm my body down. I wish there was such a thing as scratch and sniff computer screens, because this body wash smells SOOO good. In fact they all smell really good (which is why I was eeny meeny miny moe-ing to begin with! ), and it was only a day or two before I decided that in order to be thorough, I really needed to try out one of the body washes from the body butter collection too. 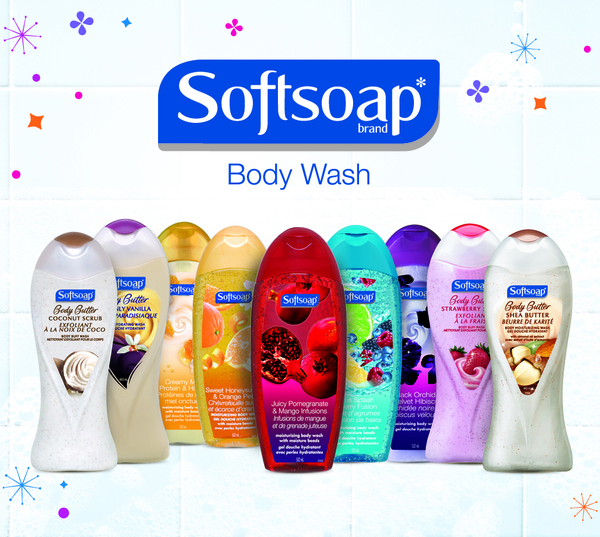 The fabulous people at Softsoap would like you all to have a coupon for $0.75 any of their body washes! Click here to get your coupon. So go ahead, give your skin the moisture it deserves! 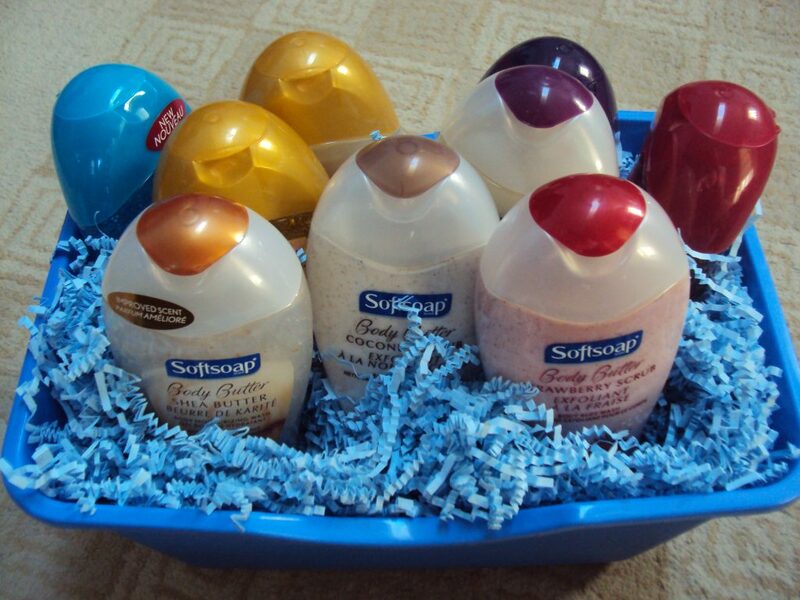 Once you’re printed off your coupon, come back here because Softsoap would like to give one of my readers a basket of Softsoap products of their very own! Giveaway open to residents of Canada only. Giveaway ends 04-09-13 at 12:00pm, winner will be contacted and will have 24 hours to respond before another winner is chosen. I am participating in this campaign with SheBlogs Media on behalf of Softsoap. I received compensation for participating in this campaign and for sharing my honest opinion. As always, all opinions and thoughts posted in this review are 100% my own. They are not for sale. I sniffed all of these at a store the other day….they all smell so good! 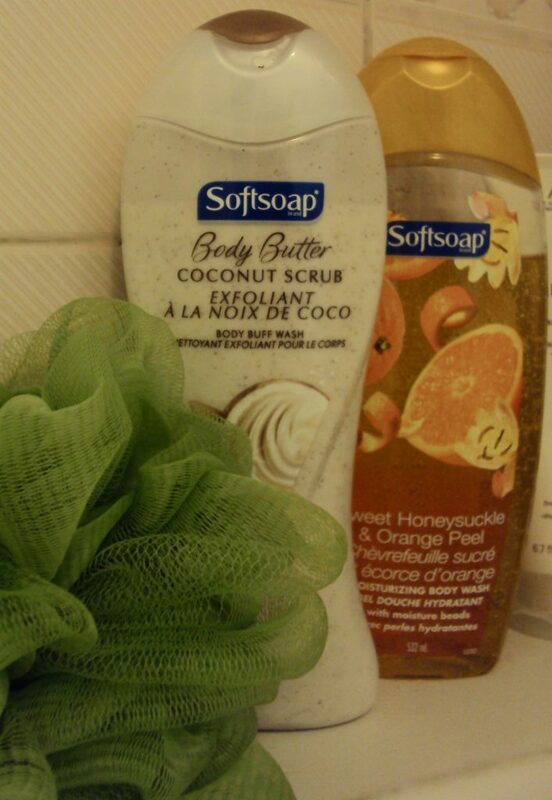 I love Soft Soap products. The cost effective and still great quality. Great brand! Hope to win. I loooove delicious smelling showers and am always looking for new products and scents to try. Anything citrus based is usually my fave! Have never tried this product, but would love to win this and give them a try. I love to soak in a hot bath, or read or even do a yoga session. I love a nice hot bath with lots of bubbles and a good book! my favorite me time is usually a walk. nothing like fresh air and chirping birdies to refresh the soul. I love the softsoap products I have used before but these beauties are new to me and I would love to be able to try them all….and share your dilemma of having to choose which one :). I must say that anything tropical would be divine!!! Me time is reading the latest gossip magazine with a cup of coffee in hand! My favourite way to enjoy me time is to do a facial mask and give myself a pedicure. My favourite way to enjoy “me” time is the gym or reading a book WITHOUT help from the dogs or the cats haha. I also ADORE softsoap products! My favourite way to enjoy me time is curling up in bed and reading a good book. I enjoy a hot drink and some good reading for my me time. Having nice relaxing time on the computer. Me Time = Coffee on the deck, first thing in the morning. Ahhhhh. definitely a bubble bath with a glass of wine so this soap would come in handy! I love to unwind with a book and tea. Delve into a good book! my fave way to spend ‘me’ time is relaxing in front of the tv, on the sofa, and not checking my phone or email. I love doing yoga during my me time. Me time would be reading a book UNINTERRUPTED. And some tea and Bailey’s. my absolute favorite way of enjoying me time is going to a spa…so luxiourous. 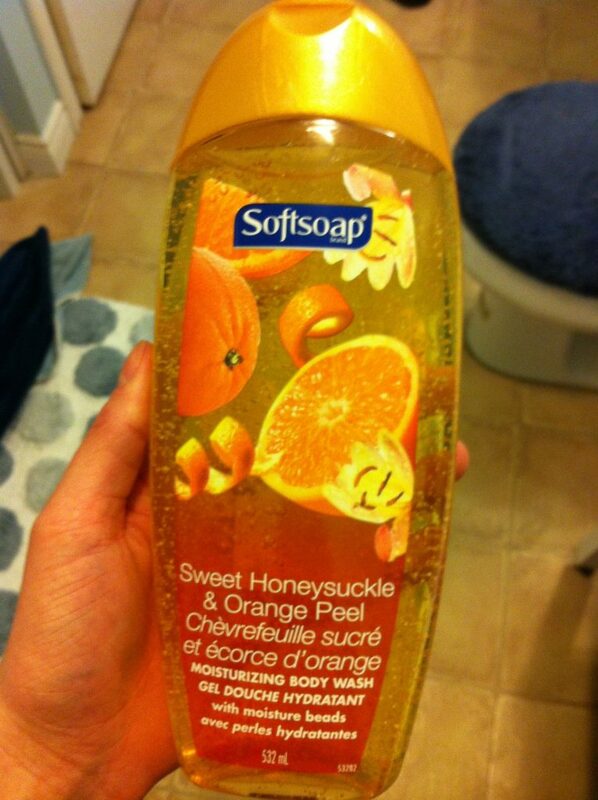 I’m always looking for citrus scented products and the Sweet Honeysuckle & Orange Peel body wash looks great! For me time . . . a cup of a tea and a good book! I like to run during my free “me” time. Me time is a nice bubble bath with no babies needing my attention. Hot bath and a great book! Me time is taking a nice warm bath. Just relax after a long day of work. I relax by reading a book and having a cup of hot tea! I love relaxing in a hot bath. I like to watch a movie and relax for me time. A relaxing hot bath with a candle lit is my “me” time! Lets me relax. Kicking back with an ice-cold cola and a good book! I’ve used the coconut scrub one before and it was nice! The best me time is totally the zone I get into during an intense workout. I would love to come home to the coconut scrub! 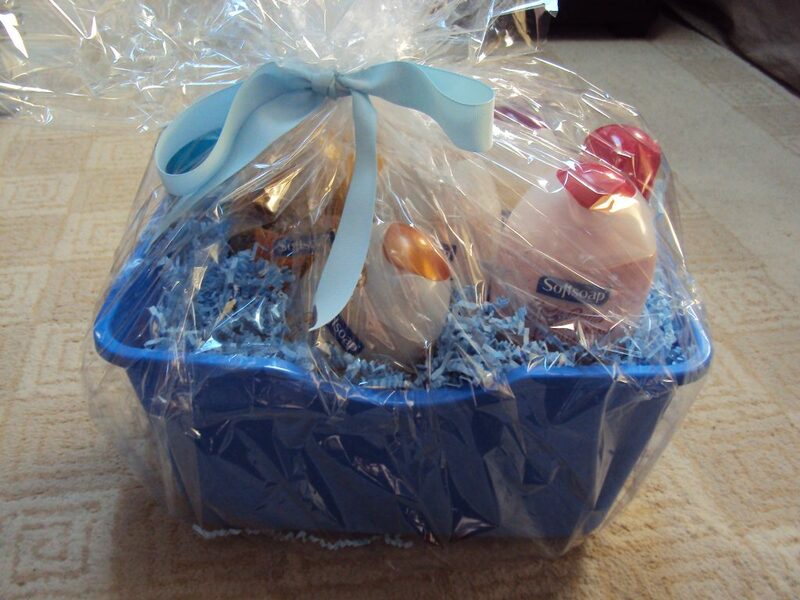 Soft Soap products are affordable and smell delightful! Although I haven’t tried the scrubs yet I’m looking forward to trying the coconut scrub! My me time is playing Farmville 2. I’m so totally addicted, but it’s relaxing for me. My fav me time is just sitting back reading a good book….normally in my pj’s. I like to take a walk and enjoy the outdoors. That’s my fav ME TIME.